I skipped last week’s episode because a) I didn’t watch it until this past Sunday and b) the episode was pretty terrible. I thought the storyline of Beth wanting to drink was pretty stupid and all the angst just got on my nerves. If it was truncated to part of an episode, it may have played better, but instead they devoted the entire hour. Forget the Regulars. Show Us More Bob! Since the beginning, the show has been about Rick and Carl and has expanded to focus a lot on (at certain points), Lori, Shane, Andrea, Carol, Daryl, even the Governor. Bob is one of those ancillary characters that is always there, but is impact isn’t quite relevant in the trajectory of the story. This episode, however, opens up with a montage depicting how Bob came to become a part of the group and his character development is one that made this episode an interesting one for me. We see Bob alone for what is probably quite along time until he happens upon Daryl and Glenn. You can see in his eyes that the time on his own has worn on him and that he wants nothing more than to be apart of a group again. It’s good to see the ramifications the elements can have on a character in few words and how it skews his decision-making away from how someone like Sasha interprets the world. 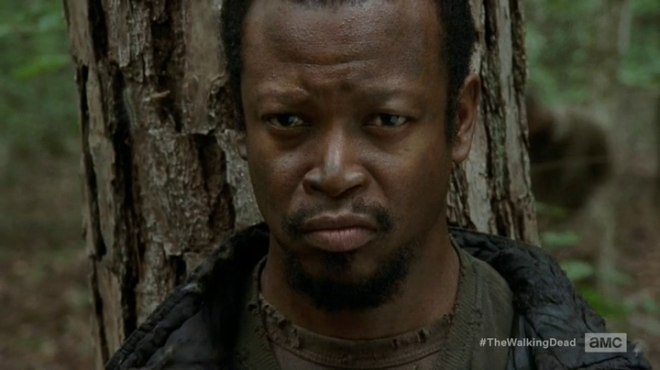 She’s always had Tyreese, so she doesn’t know what the world is like with virtually no one. Bob’s been on his own, so he’s not ready to throw away human contact with anyone and he’s not prepared to set someone off to a fate he couldn’t wait to get away from. It’s simply refreshing to see where a character whom we haven’t spent a whole lot of time with comes from. Is Beth legal? Honestly. This is a serious question. 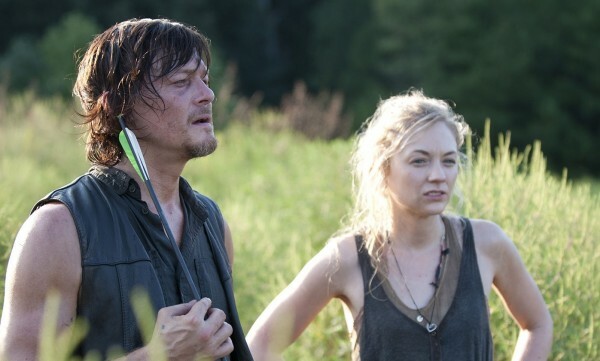 Actress Emily Kinney is 28, but she looks 16 and she portrays Beth like she’s about 12. That didn’t stop her and Daryl from making doe eyes at each other in the most romantic place on Earth: a mortuary. Maybe it was the smell of formaldehyde. Maybe it was the seduction nature of the candles that had the two looking to make flowers with each other. Obviously, I’m skipping ahead because the two of them merely exchange meaningful glances, but the Zombie Apocalypse’s Most Eligible Bachelor is racking up quite the Rolodex (look it up) of fine honeys that he’s put on his “To Bang Later” list. Which is a bold move, seeing as how you can’t count on surviving the night when the dead walk. Anyway, I have no idea how old Beth is. But seeing as how I learned her name was Beth just a few episodes ago, I’d say that’s not unreasonable. Guess what: if Henry Winkler guest-stars on Law & Order: Special Victims Unit, he’s probably guilty. You simply do not hire a recognizable actor to be the guy unloading a shipment of fresh fish in SoHo when he used to be the Fonz. Likewise, although he’s not exactly the Fonz, enough people will recognize Jeff Kober as Mayor Hale from Sons of Anarchy to realize that, when he made a blink-and-you-missed-it appearance in the episode “Claimed”, it was not going to be the last time you saw him. I’ll be interested to see if his role as Joe runs parallel to any storyline in the comics, because there are a few possibilities that he can take the place of. He could be an interesting character, because currently, the show is without a proper villain and all this walking can only sustain itself for so long without some sort of outside interference. Agreed about Bob. 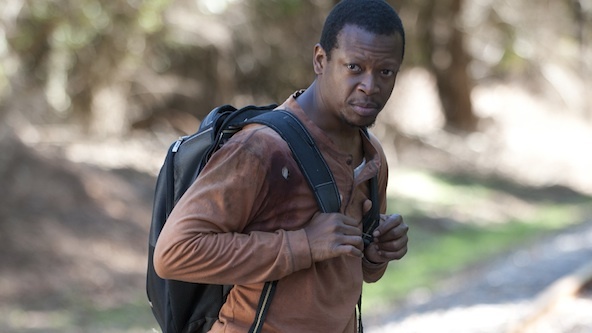 Really enjoyed his backstory and seeing him survive until he happened upon Glenn and Daryl. Though I wish, when he and Sasha were together, he did not always refer back t his past. We get it, he used to rough it on his own. 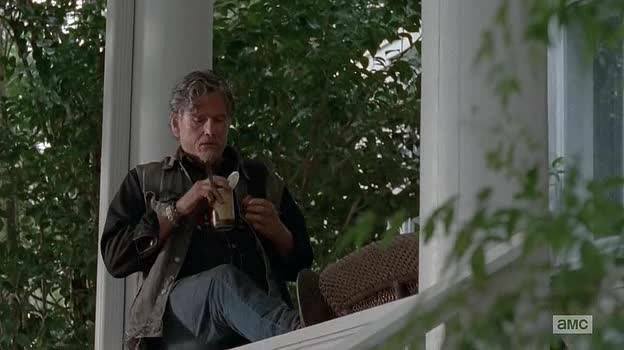 As for Bob, it took a second viewing for me to recognize him as the same man that occupied the home where Rick, Carl and Michonne stayed. The comic book fan in me wonders if he’s part of a particular group that would be introduced around this time, but it’s all just speculation right now.